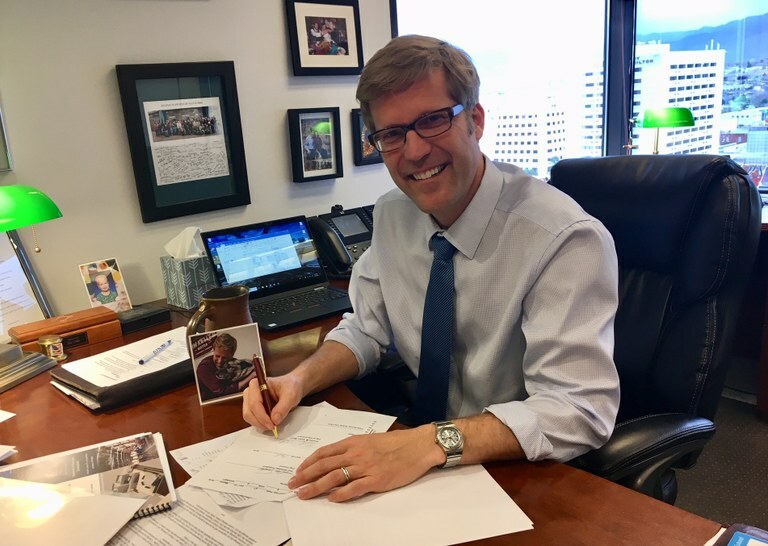 Mayor Tim Keller signed a bill condemning animal abuse in the form of coyote-killing contests within the city of Albuquerque and its immediate vicinity. ALBUQUERQUE, NM -- Mayor Tim Keller signed a bill condemning animal abuse in the form of coyote-killing contests within the city of Albuquerque and its immediate vicinity. The resolution was sponsored by City Councilor Diane Gibson and passed the City Council unanimously. The resolution, R-18-5, also calls upon the New Mexico State Legislature to introduce and pass legislation prohibiting coyote-killing contests throughout the State. "We are taking a stand in Albuquerque to oppose gratuitous coyote-killing contests," stated Mayor Keller. "Cherishing the outdoors and treating animals humanely are core values of our city. Coyote-killing contests defy the principles of conservation and wildlife management that will allow us to continue enjoying our mountains, rivers and wildlife for generations to come." The resolution opposes future coyote-killing events organized, sponsored, arranged or held within the City of Albuquerque or its immediate vicinity, saying the contests are not representative of the killing of desert wildlife in a manner that is humane, respectful and safe. Such contests are typically promoted as entertainment and feature cash or other prizes based on the number of coyotes killed. According to the bill, the indiscriminate killing of coyotes, while legal in New Mexico, serves no legitimate wildlife management purpose and appears to encourage the wanton taking of life, much like the blood sports of dogfighting or cockfighting. "This resolution shows that the City of Albuquerque is humane and will not tolerate the senseless slaughter of massive numbers of coyotes for sport," stated City Councilor Diane Gibson. "The resolution does not prohibit people from defending their homes, pets, or families from coyotes. As a community, being respectful of life and our natural environment are values that we want to continue to uphold." Although the City recognizes and honors hunting and fishing events for properly licensed hunters and anglers, coyote hunting contests are at odds with the city's goal to treat all creatures humanely and prevent unnecessary suffering and death.